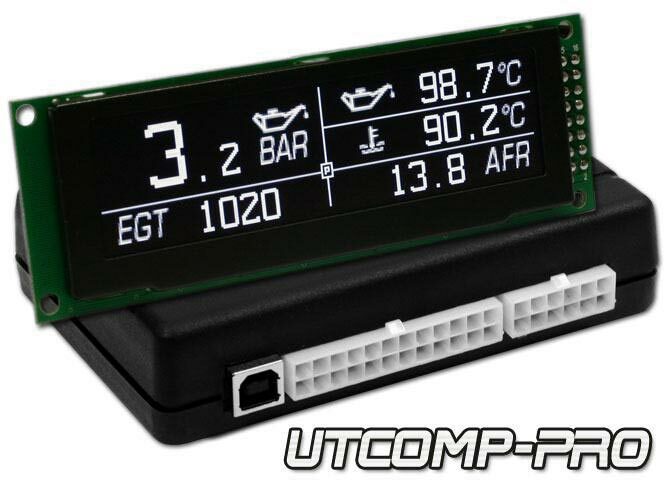 UTCOMP-PRO set with OLED 3,2" display and accessories. All in one gauge - all important readings on single OLED display! Connect external sensors and keep under control all important readings such as oil / water / transmission temperatures, oil / fuel / boost pressures, air fuel ratio (afr), exhaust gas temperature (egt) etc. Set customizable alerts and record data using internal data-logger. Use typical board computer functions such as speed, distance and fuel economy measurements. Full UTCOMP-PRO description, software and manuals can be found in Products -> UTCOMP-3 / UTCOMP-PRO. USB 2.0 1.8m cable (A/B - "printer" type). joshua · 1 years ago. Anton · 1 years ago. Radoslaw · 2 years ago. plikinfo · 2 years ago. silverbullet308 · 2 years ago. jnr91 · 3 years ago. samurai_jan · 3 years ago. ksieciunio1984 · 3 years ago.